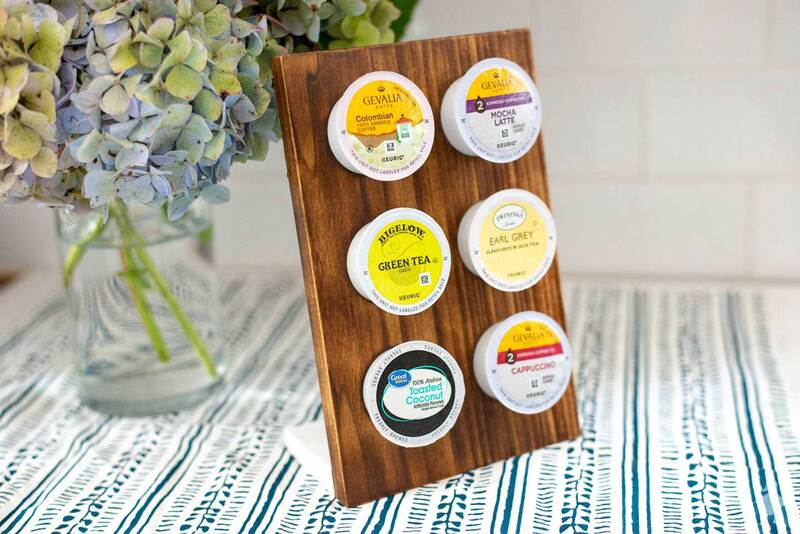 This small DIY K-cup holder made from scrap wood is perfect for my kitchen’s limited counter space, but it would also look great in a guest bedroom! I love using scrap wood to better organize my kitchen, such as when I cleaned up my utensil drawer and when made a better bottle opener. This project is no different, except for one twist: this isn’t stained. I used FIRE to darken this piece of poplar, and the tutorial below is going to show you how! This project is sponsored by Bernzomatic. I have a coffee maker next to my fridge and have used it for the last few years. In all honesty, I’m not much of a K cup fan. I can appreciate its convenience, but since I work from home, I usually just make a pot so I can refill as I please. K however, is a big fan of his Keurig. He loves finding old cameras and other electronics at Goodwill, then cleans them up and/or fixes them. 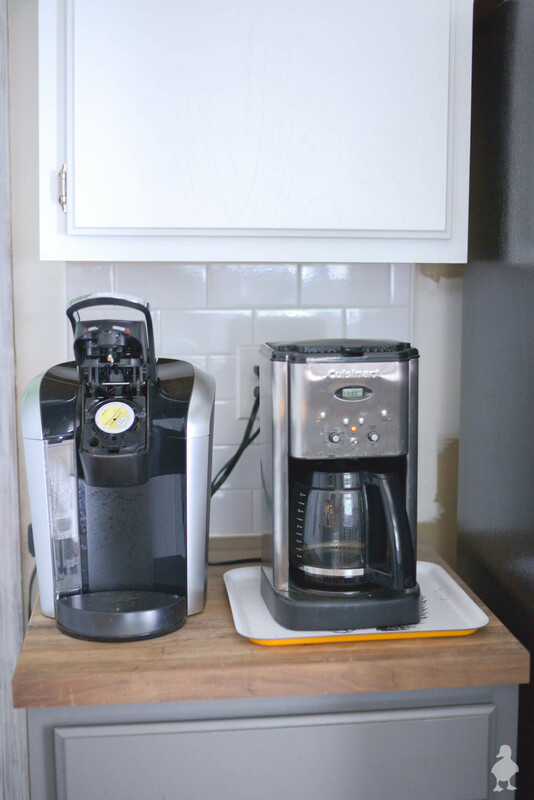 The same happened here, which is how we wound up with a second coffee maker. I don’t really use it, but he does, so it joined the kitchen shortly after him moving in. 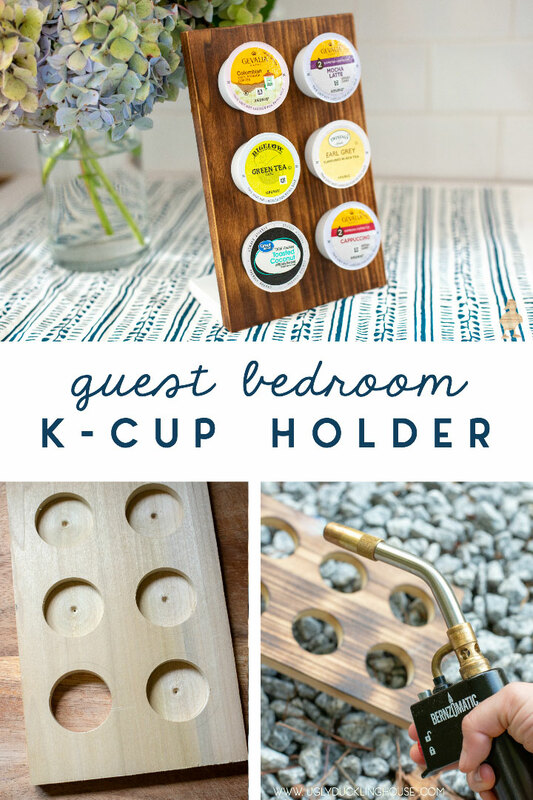 I’ve got a plan to eventually move it into the guest bedroom once the Murphy bed built-ins are complete (because it will double as K’s office and will be great for guests to use), so I thought it only fitting to make a K cup holder to go with. In truth, I have a more elaborate one in mind later on, but I wanted to give this a try first. 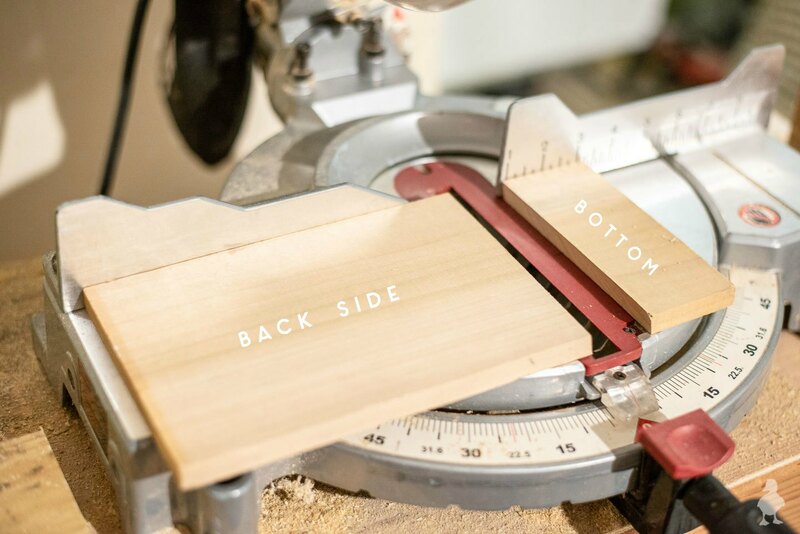 I knew to set my miter saw’s bevel to 12 degrees thanks in large part to this tutorial from Bower Power. But, I took it one small step further and cut both the base and the bottom of the front at an angle. That way, when glued together, they would lay flat on the counter. But, don’t glue it yet! It’s a LOT easier to drill through it as a separate piece. 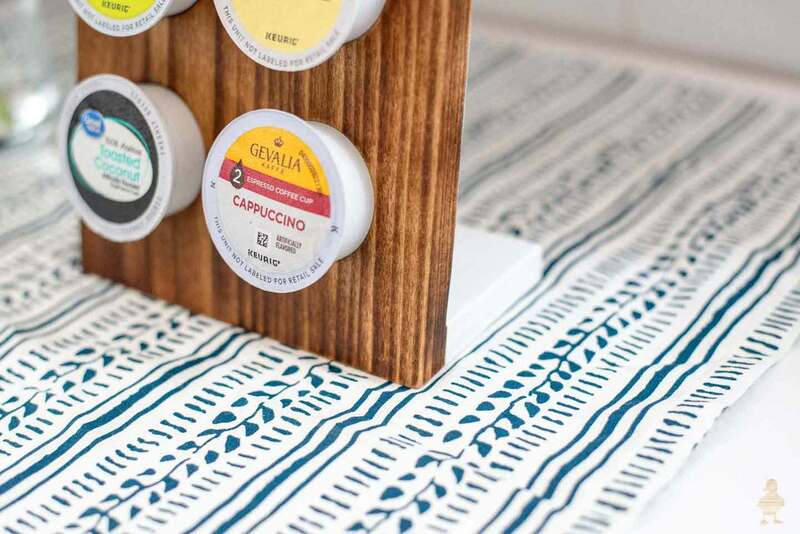 I took a K cup to use as my template and figured out that 1/2-inch was a good rule of thumb for all spacing — measuring from the top to the first K cup, sides, bottom, and spacing in between. You’ll notice that this leaves a little bit wider of a bottom space than the 1/2″ that everything else has. 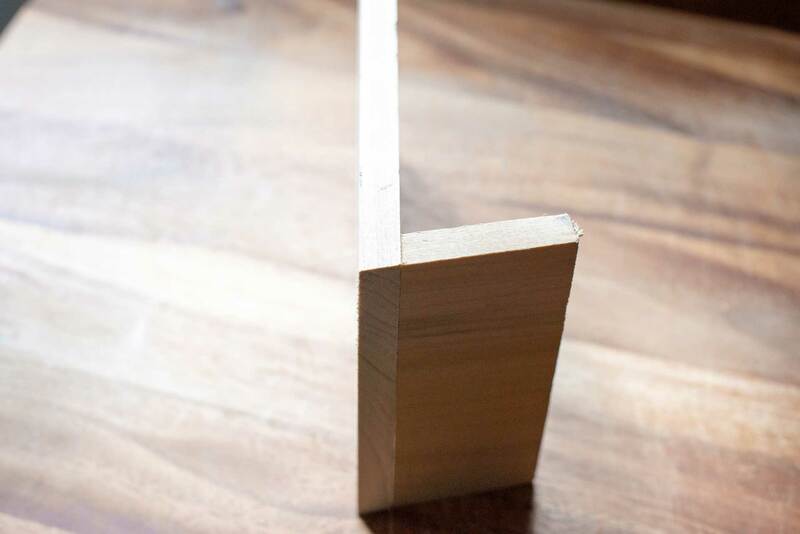 If this bothers you, you can make the piece shorter and shave off a little at the bottom. 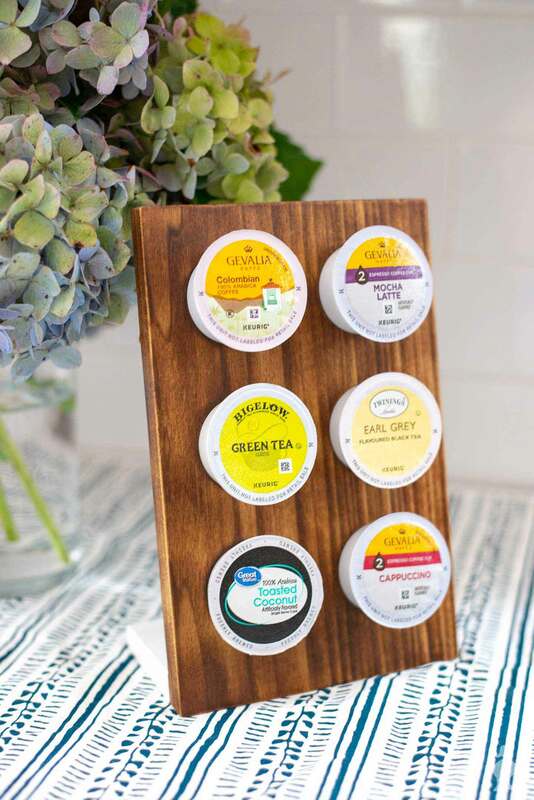 For me, this slight bit of extra height made it easier to pull the bottom K cups. As I measured, I marked all cross points. I then drilled through this center point to mark the center of each hole. 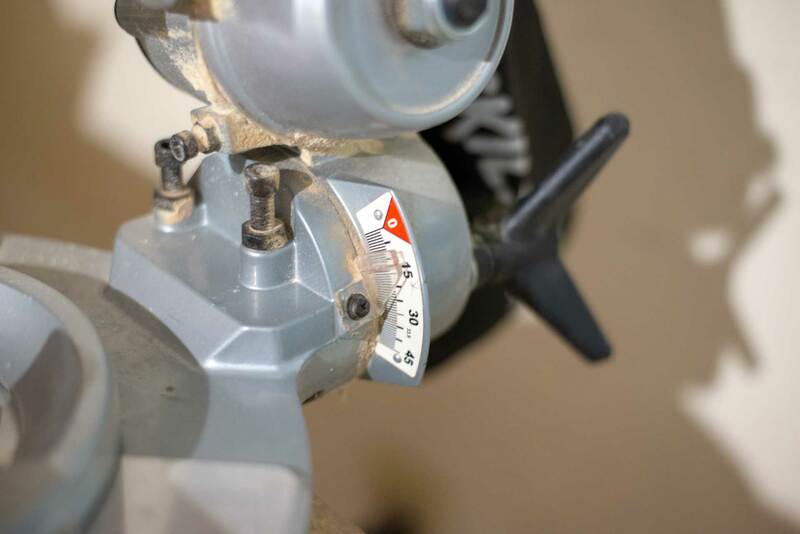 It’s entirely possible to drill holes with a drill, but I used my dad’s old drill press (it allows me to clamp the piece down and make sure I’m drilling through at an exact 90-degree angle). I used a 1-5/8″ Forstner bit because K cups are conical in shape, so the bottom is narrower than the top of the cup. 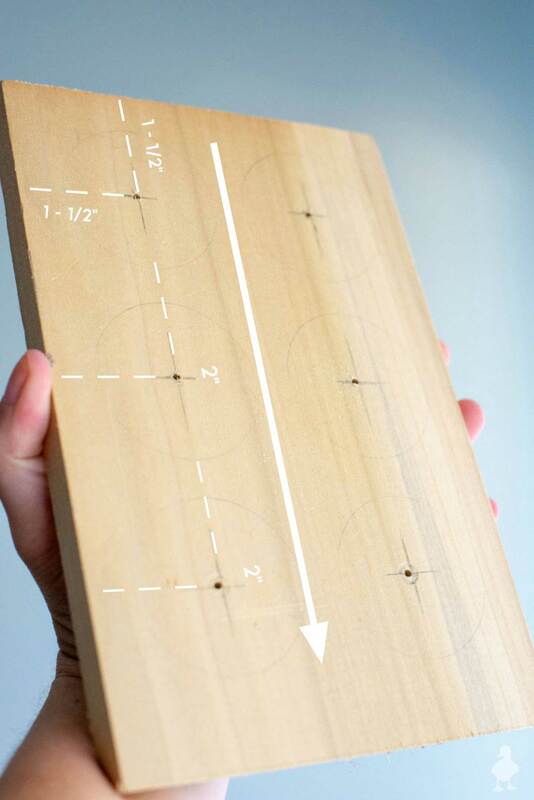 This measurement is a midpoint, so the cups won’t slip out of the back or the front. To avoid tear out, I drilled about halfway through the front of the hole, then flipped it over and drilled the rest. 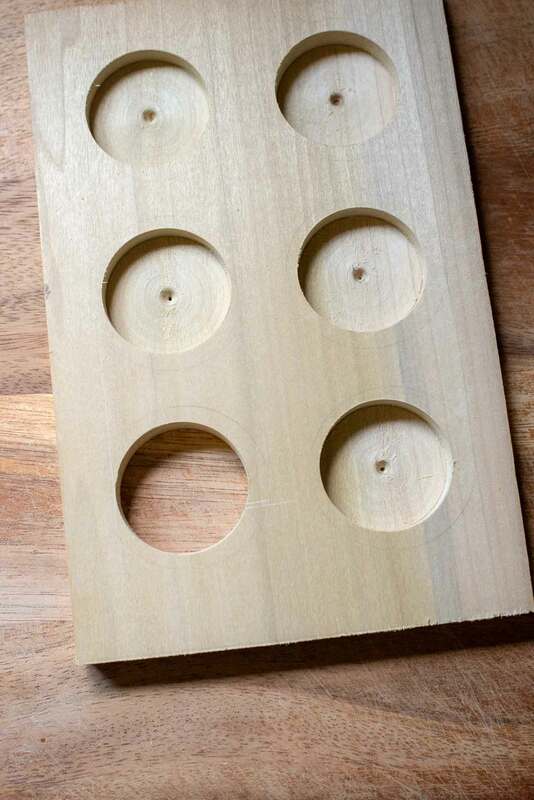 Since I had pre-drilled a hole in the center in the previous step, I could line up the holes perfectly. 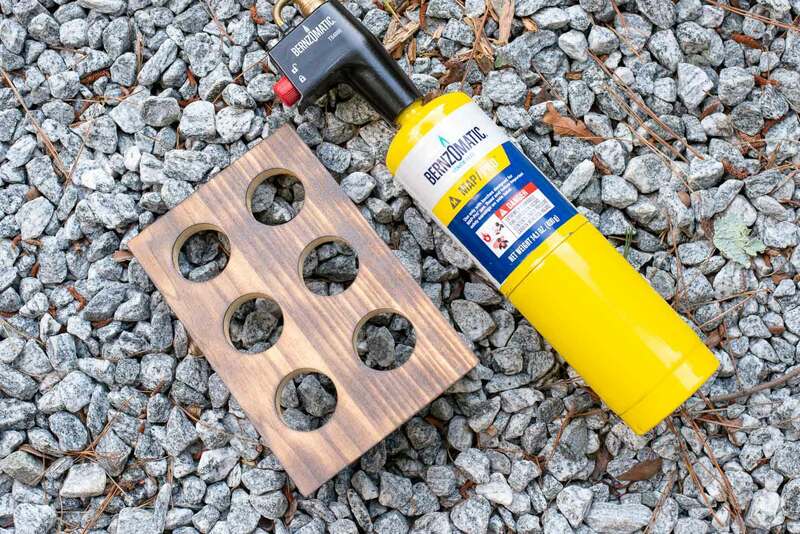 I’ve been a sponsored partner with Bernzomatic this year on a few projects, and this was another one that I thought was perfect to give wood burning a try. I chose to glue the pieces together before the next step, which wound up working out just fine. As I was torching though, I was very mindful not to put heat directly on the glue joint; the heat would likely cause it to fall apart. At one point I thought I got too close and the shorter piece on the back curled a little, but once I let it cool back down again, it was nice and straight. With the way the poplar grain ran almost straight up and down through the entire piece, I wanted to see if my torching skills could give me an almost faux Zebrawood effect (a much pricier and harder to obtain wood species). I think I got pretty close, though it takes a little practice to make sure I kept an even heat on the entire length of the grain; splotchy burn marks are a dead giveaway! Once the torching was done, I gave it a good sanding and painted the back and bottom piece of the K cup holder with a few coats of white paint. I also applied a few coats of wipe-on poly to the front. Then, loaded ‘er up! It’s already proven convenient. We recently had one of K’s brothers stay over at the house mid-week. 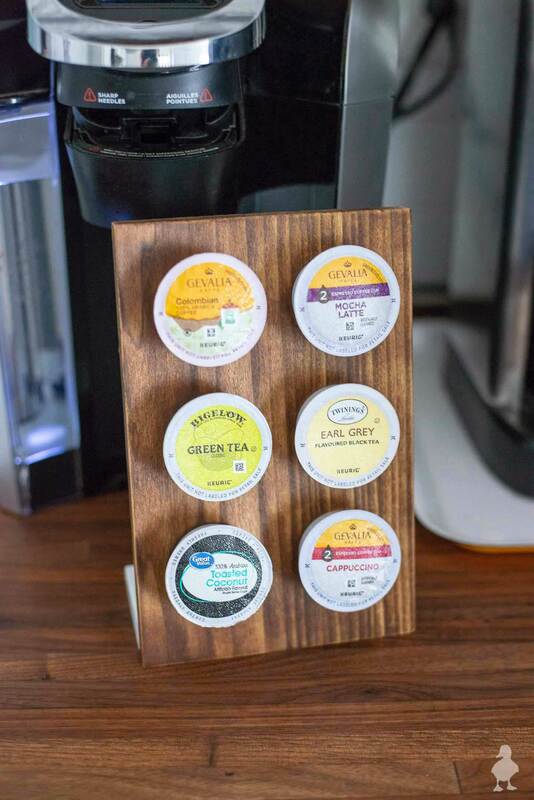 Since I knew I wouldn’t be up in time to make a pot of coffee (my usual schedule is to sleep a little later, work on projects during the afternoon, and do computer work at night), I left this little K cup holder on the counter for him to grab what he needed. Since it takes up such little space on the counter, it was easy to use and then tuck away. Personally, I think my favorite part is how the heat really popped out the grain and made it look stripey. 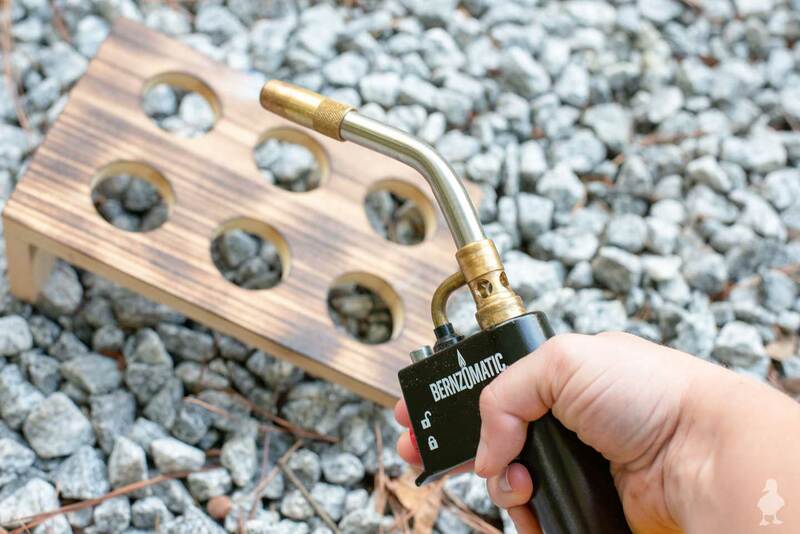 Would you ever use fire to stain wood? P.S. 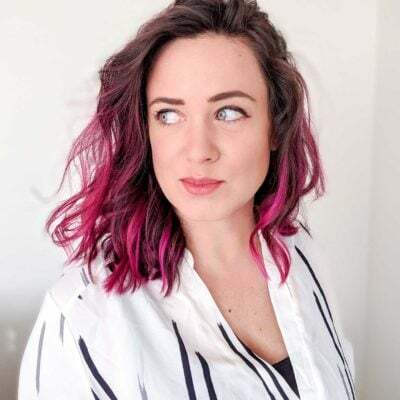 : this is also related to a Japanese preservation technique called shou sugi ban; I tried it earlier this year with a s’mores tray for outdoor entertaining. You can also add stain on top. I love how different it makes common woods look!